I just celebrated my 15 Year Anniversary of making the big leap from a full-time software sales job to start my full-time coaching business. Anyway, when I made the transition from Employee to Coach & Biz Owner, there were a lot of ups and downs. I did a few things right and made a whole bunch of mistakes! If you’re not yet coaching full-time and it’s something you aspire to, I want to help you avoid the “downs” and “mistakes” that I went through and I see SO MANY coaches needlessly experiencing. => The Top 3 Reasons why so many coaches fail to successfully launch their coaching business, and what you can do to avoid these deadly mistakes. => The #1 Most Important Skill you need in order to grow your coaching business quickly. => How to choose if a “Fast” or “Slow” transition will work best for you. => How to determine the amount of finances you need to make the transition… And what to do if there is a big gap between that number and where you are right now. => Which business-building elements to focus on first… And which ones to hold off on. => How to consistently build your belief and confidence, even when you’re experiencing self-doubt … And MUCH, MUCH MORE! Discover how to go from Employee -> Coach! This is the only time this Training Class is being offered LIVE. You’ll also have the opportunity to ask questions and receive expert coaching and feedback on your unique situation! Ready to discover how YOU can most effectively make the leap to a successful, full-time coaching business? YES! Reserve my spot now. 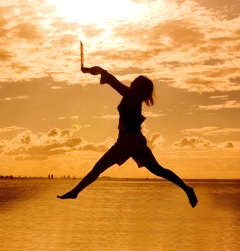 Here’s to making “the leap” and zipping down the road to your thriving, rewarding and profitable coaching business!